Crowdfunding and football haven’t really established a workable relationship yet, but the potential is there. Tifosy, from Italy, may have the answer. Gianluca Vialli is always a welcome figure in England. He was a popular player, an even more popular manager and his gentle tones, dapper appearance and relatively humble persona made him a fans’ favourite. 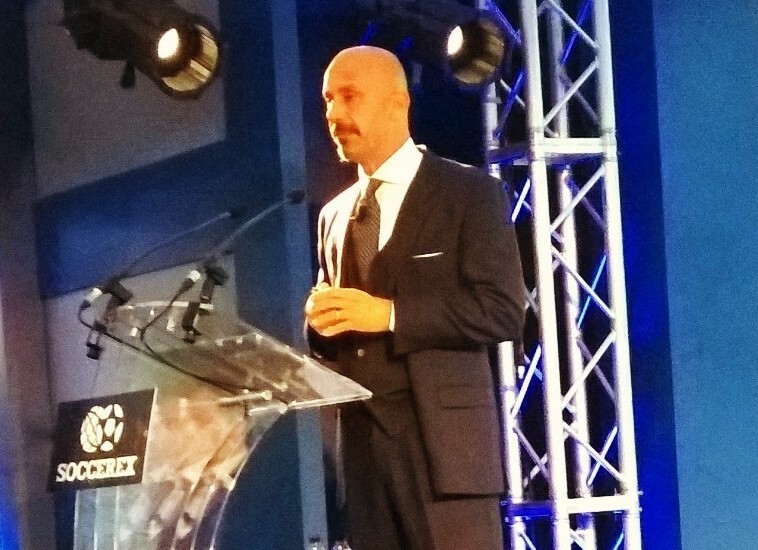 Vialli is supporting a new football-focused crowdfunding scheme called Tifosy, but before launching the idea with the audience at Soccerex, he spoke of the differences between English and Italian football. While admitting that the world had been brainwashed into believing that the English Premier is the best league in the world, he said that Italian football is more “tactically knowledable”. Vialli said foreign players adapt to the English approach because the game’s DNA is so overpowering in England. He added that when he came to the country with Chelsea, it brought the best out of him. “My desire and attitude changed – I stopped diving,” he laughed. It is the power of the crowd, be it in any country, that Tifosy is trying to tap into. Vialli’s colleagues reminded the audience that football’s popularity makes it a potent force – for example, AC Milan has more fans than Nike, Arsenal has more social media followers than Starbucks. “Football is one hell of a crowd”. There are hurdles to overcome. Although stadium projects are springing up all over Europe, almost 90% of football academies are of a low standard. There are 3.5 billion fans in the world and the global sports market is worth some EUR 120bn. The financing needs of football clubs in Europe are around EUR 25bn. But with so many fans and a huge social media following, the amount of online funding is negligible. Tifosy unveiled some frightening statistics. For example, the English Premier hands 58% of its revenues to players, the Championship 105% (an especially daunting figure), League One 84% and League Two 74%. Real Madrid’s revenues are three times that of Inter Milan and the English Premier’s revenues from TV alone are greater than the total revenue streams of the Bundesliga. Across European football, there are huge imbalances. Tifosy do their research, work on a plan and then launch the scheme with minimal fuss. They’ve worked on programmes with the new Parma club (which is hoped to break all records), Portsmouth, Juventus, Bruges, Inverness and Porto. The secret is to have a worthwhile cause. Portsmouth, for example, funded facilities for a youth academy. It was preceded by a poll among their fans (some of the most loyal in England) and eventually raised £ 270,000. The rebirth of Parma is something that has really captured the emotions of local people and Tifosy expect the programme to beat the Pompey campaign. Another new scheme is to crowdfund a film of George Best’s life, which was being unveiled at Old Trafford this week. Next Entry Soccerex: India – tomorrow’s football giant?